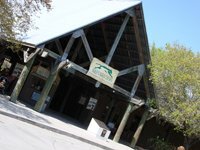 The Brevard Zoo is about as far South as this guide will cover, but it was so worth it I wanted to include it! This zoo features so much for families, it would be a perfect fun trip even if you live in the very Northern part of the state. They have a very nice children's play area that has a large splash pond with various sprinklers, and a pretend fishing boat. They have a petting zoo with unusual animals I have never seen before in a petting zoo, like a gopher tortoise, an armadillo, and baby deer! They have an indoor activity center where kids can be pretend veterinarians with stuffed animals, lab coats and pretend instruments and tables. Kids can pretend to be scientists and dig up pretend bones in a giant sandbox. Outdoors they have an adobe type playhouse with a climbing net and a pretend nest inside with eggs. The whole zoo is very walkable and on wooden boardwalks throughout. You can even rent a kayak and go on a natural safari on the river to see what you can find! We had a very enjoyable time and looking forward to our next visit!